… the smell of wet ground just as a storm is starting. … watching the rain pour down … from inside. … that I don’t need to go water the garden. … knowing that turning on the oven won’t overwhelm us with the heat. … leftover tortilla chips from last night’s jazz in the sculpture garden (when it was *not* wet). … a big mug of tea. … an afternoon I can spend inside without feeling guilty about not enjoying the nice weather. … the idea of a clean apartment (because I do *not* love cleaning). 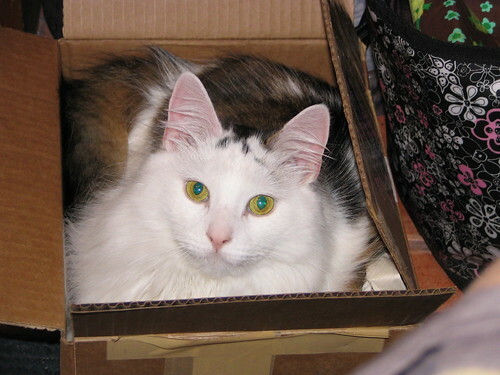 … curling up with my sweetie and the cats. Category: life -- uncategorized. There is/are Comments Off on i love. 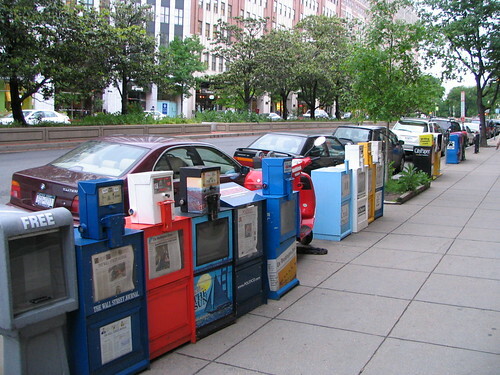 This row of newspaper machines, found along a generic half-block stretch of Connecticut Ave., reflects the affection D.C. holds for its printed matter. D.C. is home to a number of print media outlets: two real dailies (The Washington Post and The Washington Times), a faux national daily (The McPaper aka USA Today), two free weekday rags (The Examiner and The Express), a citywide weekly tabloid (City Paper) and any number of weekly neighborhood publications (such as the The Creek. We also like to read other cities’ news — thus the stands for the Wall Street Journal, the N.Y. Times and Post, the Philadelphia Inquirer, and the Baltimore Sun. Despite the District resident’s fondness for online news (I admit to an RSS feed bookmark from the BBC on both my home and work machines) and for CNN (where other cities broadcast sports in their bars, at least one set here is always tuned to cable news), I still think that, at heart, we love our newsprint. People gobble up the free newspapers as if they were samples at a barbecue, and the Metro is filled with readers hiding behind their broadsheets in the morning. And let’s face it: while job and apartment hunting is infinitely easier online, there’s nothing like curling up with the Sunday Post and a hot drink and reading the comics. They just aren’t as funny on a computer screen. Don’t forget to stop by fellow My D.C. photogs Hillary, Sarah, Rudi, and MsP. Mia, who blogs about her Maryland town of Frederick, is currently on hiatus dealing with a family situation. Our thoughts go out to her. 1. It seems so pedestrian to note it, but having Monday off really is a nice thing. Three days is just about enough time to really wind down. 2. This week’s strawberries are close to perfection. They’re big and red and firm and sweet — and taste of summer’s promise. 3. I pass a young woman, perched, talking on her cell phone. She’s dressed in a well-tailored business suit with a crisp Sangria-colored blouse — and bright blue Crocs. A tote bag, presumably filled with uncomfortably smart heels, sits at her side. Category: three beautiful things. There is/are Comments Off on a day later, peak, and tote bag. Ten years ago my brother graduated from college and Rudi and I journeyed down from Connecticut to D.C. to wish him well. We ended up brunching at a hotel that is mere blocks from where we live today. We also headed back to New London to see Sam graduate from Conn. Pretty much anything sweet and/or baked. Ice cream. Peanut butter-filled pretzels. Tortilla chips. Raspberries. Blueberries. Travel to see all my friends and then to all the places I’ve ever wanted to go. Buy a house, complete with large claw-foot tub, built-in bookshelves, and working wood-burning fireplace. Pay off all the debts, mortgages, etc., for the family. Give books away to every kid I encounter. Knit and read at the beach for the rest of the summer. 6) Who I’m tagging: Bueller? Bueller? three days gone… when’s the next long weekend? The nice thing about the second half of the year is that you don’t have to wait nearly as long between holidays as you do at the start of the year. For the record, our next long weekend (July 4 is a Friday) is less than six weeks away. How was your weekend? Did you fritter it away? Were you productive? Most importantly, now that it’s over, are you happy with how it went? All in all, I probably could have spent a little less time in front of the computer, but generally I’m pleased with my three days off. A trip to Eastern Market to see what the crafts vendors have to offer. I took care of this item right away on Saturday, hitching a ride across town with Rudi, and also managed to tuck a trip to a library in as well. I didn’t find any gifts, but I did restock my dwindling card supply (people get so touchy when you give them sympathy cards when they start new jobs…), buy a headband, and purchase a makeshift picnic which I ate on a bench near the vendors. Some time in the garden to water, weed, and give the peas and beans a lower rung on my teepee. Ooh! This one I did twice! I went Saturday and added a lower rung and gave the garden some water. And then Rudi and I went over again today and we added yet another rung and I added vertical string to aid the climbing process. Rudi planted cucumbers and bush beans and we gave the garden a good dousing, which ought to guarantee rain tomorrow. Knitting — I have two socks on the needles, as well as a shawl and a swatch for a summer sweater. It would be exciting if something came off the needles before next week. I think I have finished my swatch. Okay, I know I have finished my swatch; I’m just not sure it bears any resemblance to the gauge I’m supposed to be getting for the sweater I’ve decided to knit. I’d always envisioned a summer cardigan when I thought about the yarn (a lavender cotton-linen blend), but when I saw Sorelle, I knew that was what I wanted to make. I also aired the stash this weekend. Let’s just say that I ought not to buy yarn again for a while, shall we? But doing so did give me the opportunity to think about some of the items I’d like to make for the Summer of Socks that starts in less than a month. My needles are ready. Reading — I’m nearly halfway through The Book Thief and have to get cracking on some of the challenges I’ve signed up for. Okay, so I carried The Book Thief all the way across town with me earlier this weekend, but, as I mentioned, I stopped at the library. The Northeast branch, which is not my normal branch, had the third book of Rick Riordan’s Olympian series, The Titan’s Curse, which my branch library never has. So I took it out. And read it. And read it. And read it. And then it was done. So sad because it was so good. The penultimate book came out recently and the fifth and final book of the series will probably come out sometime next spring, so at least I still have a few more Percy Jackson novels to read. Yay! Hanging out with friends — If I head to Cap Hill tomorrow, I might meet up with Sarah for a little while. And on Sunday, I’m helping another Sarah with some furniture moving in preparation for her impending move to Lima, Peru, and then having a (late) brunch with my friend Susan. The good news on this item is that Susan and I had a fantastic lupper on Sunday. We didn’t get to sit outside, but they kindly placed us in an open window, so it was practically just as good. We both enjoyed our food and it was nice to sit and have a chance to talk, just the two of us. The bad news is that I totally overslept on Sunday morning and didn’t wake up until two hours after I was supposed to help Sarah move. She was gracious when I called to apologize, but I felt awful. A bike ride on the C&O Canal Towpath to see what young critters are out and about. Susan and I agreed we’d meet up after we both went out to exercise on Sunday. I road out to Thompson Boat House along the Capital Crescent Trail and back along the C&O Canal Towpath. It was the middle of a lovely afternoon, so the canal was crowded with people. If any ducklings are around, their mothers wisely kept them off the water. I did see two half-grown Canada goslings with their parents, as well as a handful of turtles sunning themselves on various logs in the water. I would have liked to head out again this afternoon, but I frittered too much of the day away to be able to go. Maybe if I get to work on time tomorrow I can head out before sunset. Cleaning and organization — I know, I know. These tasks will be limited to the dark hours, but are essential to my continued mental well-being. Baking — I regularly bookmark recipes and I’d really like to actually try some of them. In particular, there have been a couple of recent rhubarb recipes that have real potential. Hooray! Another accomplishment. I made Nan’s Country Rhubarb Dessert last night and it was delicious. Sort of like a rhubarby, meringuey strawberry shortcake. (I know!) Two more servings left for dessert for tomorrow night. Write my My D.C. post. I uploaded the pictures this morning, but I was tired and didn’t write the post. Tomorrow. Drink froofy drinks out of my new Ravelry glasses. I did not drink any froofy drinks this weekend. (Froofy drinks would require my clearing off my counters, and as you saw above, I’m just not there yet.) I did, however, finish my pink wildberry Italian soda in my “Ripped” pint glass earlier tonight. Yup. May I have some more, please?